What else needs to said when a single photo says it all. Trump just tore up the Iran deal for no good reason. The JCPOA was trashed only because Israel demanded it. Really, doesn’t the above photo tell the back story in glowing color? Trump has always been more loyal to Israel than he is to the United States. President Donald Trump has succeeded in breaking virtually every campaign promise he made during the 2016 election cycle. There was never any legitimate reason to void the internationally approved JCPOA (Joint Comprehensive Plan of Action). Trump was merely taking advantage of the anti-Obama fervor in order to get rid of the Iran deal for Bibi Netanyahu. The fact of the matter is that Netanyahu supported Candidate Trump like no other head of state because he knew that The Donald would nuke the agreement. Which Trump has now done. Has Trump kept any other campaign promise to the American people? Here’s an accounting that appeared under the heading: The Trump Reality Check. So is the age when allowed to buy assault weapons. The North and South Korea reconciliation has been a Chinese-Russian initiative. Kicking off global trade wars doesn’t help either. They lead to world wars. The preceding list only delineates Trump’s major promises that were used to build his base. What makes this list of broken promises particularly meaningful is that his total lack of success has occurred with majorities in both the House and the Senate. How does that happen … … … except by purposeful design?! 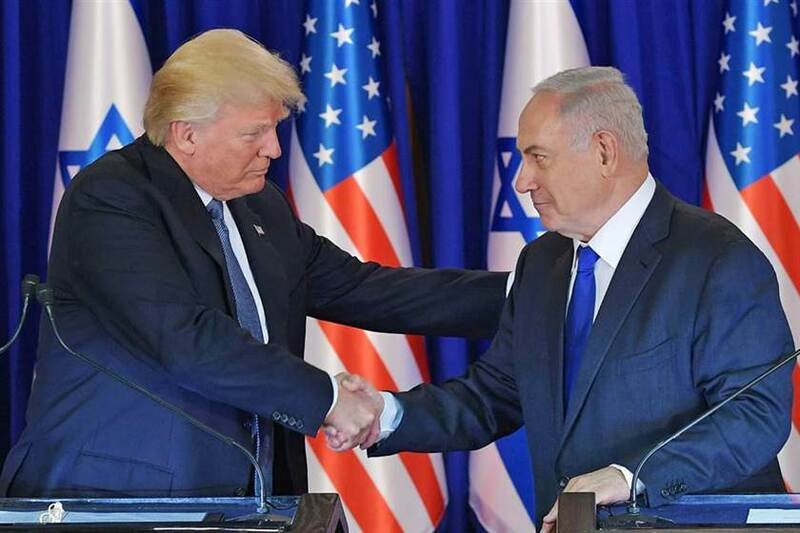 Again, the only promise President Trump successfully acted on is the one he made to the government of Israel, and especially to the ruling party of Prime Minister Netanyahu—the Likud Party. Not only has Trump not drained the swamp, he fired anyone who could assist with such a daunting task. Then he appointed some of the worst swamp creatures found anywhere outside or inside the Beltway. Every one of Trump’s financial and economic advisors was previously a Goldman Sachs or Morgan Stanley alumnus. The appointees who did not come from these Wall Street bankster firms were hired away from the Military Industrial Complex. The critical point here is that Trump really got elected because of his promise to “Lock her up!”. Not only is Hillary and the rest of her crime family not locked up, she’s galavanting around the globe playing Deep State emissary. The rest of the Pedogate-controlled warmongers are busy orchestrating their next Middle East conflagration. Truly, it now appears that the U.S. Intelligence Community is having a field day carrying out false flag attacks and other black operations at will. Trump doesn’t even investigate them, much less prosecute them (e.g. Whatever happened with the patriot slaughter in Vegas?). Likewise, the Shadow Government seems firmly in control of the White House as not even George Soros has been apprehended for his myriad crimes against humanity. KEY POINT: Trump must have repeated a thousand times his promise to end the wars, make peace and stop spending so much on military invasions and occupations. However, he has done just the opposite. The sovereign nations of Syria, Iraq, Afghanistan, Yemen, Ukraine have suffered the most from Trump’s war-making. Then there was Trump’s disastrous appointment of Jeff Sessions to the crucial AG post. The more time that goes by whereby Sessions fails to fulfill his most basic responsibilities, the more it appears to be a deliberate strategy to leave the swamp undrained. Otherwise, how could Trump have appointed such an ill-equipped, fearful and obvious co-conspirator to the critical position of Attorney General? Was this whole thing really set up in advance so as to guarantee a pass for ALL of the Deep State perps? We already know that Jeff Sessions was on the Senior Executive Service payroll as far back as 1988. Look who’s on the SES payroll. Mr. SES himself. The United States of America has a Zionist Occupied Government firmly in place for the umpteenth time. No good can come of it. Recent history has shown that these ZOG takeovers ensure that only the Greater Israel project is advanced—-by American blood and treasure. If the U.S. citizenry does not soon take back their country, the American Republic will find itself in serious jeopardy like never before.